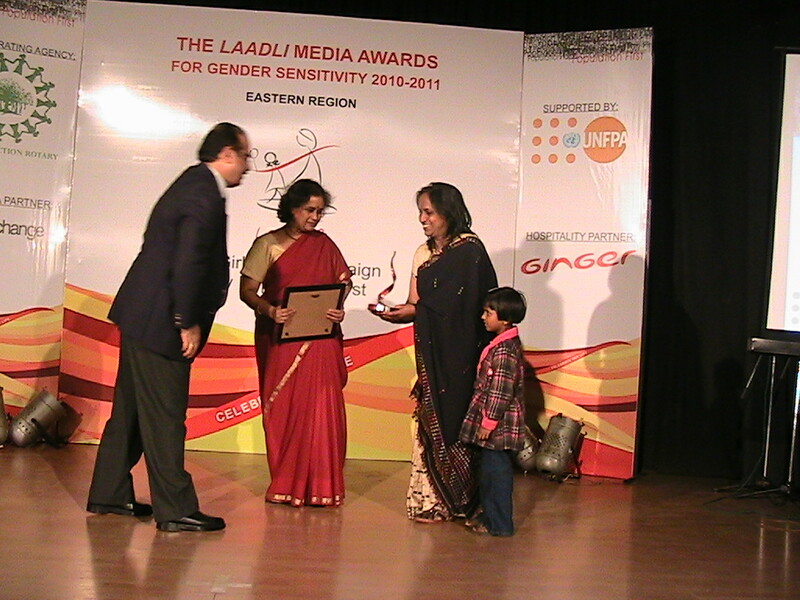 Teresa Rehman has been felicitated with Laadly Media Award for 2010-11 in the evening of February 7 at the State Information Center, Bhubaneswar (communally rechristened Jaydev Bhawan) for her report adjudged by the ‘Population First’ under UNFPA as “the Best web feature” on gender sensitivity. Her report captioned “Prayer Answered: Women Enter Vaishnavite Monastery”, which bagged the award, details how women were traditionally being denied entry into the Hindu Vaisnav temples like the Pathausi satra and its neighboring satras in Western Assam’s Barpeta district. Even the restriction was not relaxed for Indira Gandhi when she was the Prime Minister. Other victims of gender prejudice were eminent “literary stalwarts such as Amrita Pritam, Nabaneeta Deb Sen and Mamoni Raisom Goswami”, the report says. Teresa says, “from time to time, women have tried to breach the long-imposed ban on entry into the ‘kirtanghar’ or the sanctum sanctorum” of the ‘Satras’ mentioned above. But, she says, Assam Governor J.B.Patnaik has succeeded in removing this notorious gender bias by prevailing upon the temple authorities on the basis of gender neutrality practiced by the founder of the temple concerned, Srimanta Sankaradev, the saint who “had never dicriminated against his women devotees”. Sri Patnaik “took with him a group of 20 women” into the temple. “This historic intervention by Governor Patnaik, who also happens to be a Sanskrit scholar, created quite a stir. The public response was mixed. Many were outraged and upset, while a few were relieved that finally a path had been paved for women to enter the satra. There was also an unexpected triumph. A few days later, the management committee of Sri Sri Sankardev Than, Pathausi satra, formally open its doors to women”, says Teresa in her report. Teresa is an alumnus of the Indian Institute of Mass Communication, New Delhi and has won many accolades like the WASH Media Award for 2010, Ramesh Goenka Excellence in Journalism Award for reporting (print) for 2008-09, Sanskriti Award for Journalism 2009 and the 7th Sarojini naidu Prize for best reporting on women and Panchayati raj, 2007.